Developments within the last five to 10 years in mathematics pedagogy have focused on the notion of communicating mathematical topics to students using more accessible language; ever try to read and understand a math textbook? Translating mathematical ideas into language familiar to students is a challenging facet of teaching the subject. Two workshops I attended in the beginning of my teaching career had a profound effect on the way I viewed mathematics and, subsequently, shared it with students. Namely, that as we consider how to prepare students to be critical thinkers and productive citizens for the 21st century, the most valued non-academic ways of thinking mathematically occur through number sense, pattern recognition, recognizing relationships and problem solving. The objective then becomes how best to enhance these ways of thinking. The relevance of these components can be seen in the role that “big data” now plays in society. Recall IBM’s “Watson,” or the value in mining data for predictive patterns, or the different structures that companies have put in place to emphasize team problem-solving. I love puzzles and patterns – always have. These are the lenses through which I view, interpret and understand mathematics while providing a means for me to communicate mathematical topics, concepts and techniques to the boys, regardless of grade level. I begin the notes for each class by writing the date on the SMART Board. “Cool Date Day” started as a simple observation on a day when the date (month, day, last two digits of the year) created a sequence of consecutive numbers; for example, September 10, 2011, can be seen as 9, 10, 11. I recall sharing this (I admit I do not remember the first time/day I noticed it) with the class and pointing it out to the rest of my classes that day. While daydreaming soon after that, I began to think how many more years it would be possible for a date like that to occur. The last year would have to be 2014 due to there being only 12 months. What if we were in Europe where they write the date, day, month, year? Then in what year could the sequence begin again? (January 2, 2103). So then December 13, 2014, became more significant number-wise, akin to the next eclipse or one of those “once in a really long time” dates when a comet comes close to Earth. Asking the boys these questions led to wonderful analyses and discussions; I’m pretty sure we did not finish the lesson I had planned for that class, but it was fun and valuable. 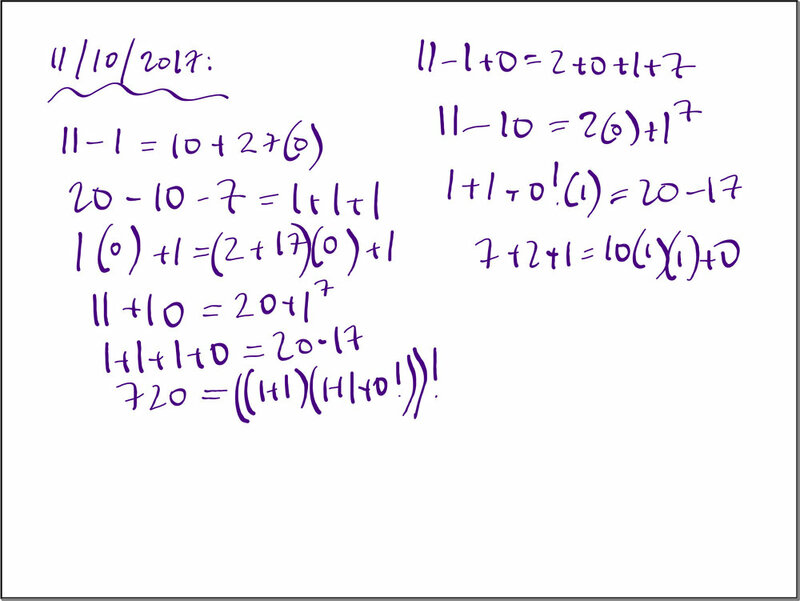 “Cool Date Day” has evolved into an activity that we spend the first three minutes of class doing in all of my classes, including Grade Six, Form I, Form IV and Form V. The objective is to create a numerical equation using the digits of the date (the year is written using four digits). The conditions are that all of the digits must be used, but only once. Digits can be used to form any number (two-digit, three-digit, etc.). The exercise promotes enhanced number sense and pattern recognition while using scaffolding – one student’s idea can help another student think a different way and develop his own idea. The progression in the boys’ thinking emerges in the number of ideas and the increased complexity. The results of the sixth graders are most apparent, as they have never experienced this activity before. While comparing one of their first attempts (on September 14) this past fall with November 10, the complexity is evident. Closer inspection reveals that whereas they began using just simple operations like addition and subtraction, they now use exponents, order of operations (grouping symbols) and multiplication – topics that they have learned since the first day and now have incorporated into their mathematical understanding. One student brought his previous knowledge of a factorial to the class during the activity. The boys were curious, so we had a short lesson on how it is defined and noted that it is commonly used in probability, combinations and permutations. Consequently, other students began using it in their numerical equations. I recall one particular Algebra II class in 2014-15 in which we found “powers of two” every day – even up to two to the ninth and 10th powers. That class became fluent in these numbers, while others built fluency with different useful numbers, e.g., perfect squares and square roots, and cube roots, etc., that constantly arise in mathematics. In past years, “extra cool points” were awarded to students getting the digits in order (you can find examples in notes from 11/10/2017) and “double cool points” for creating a numerical equation with the digits in reverse order. The boys responded too well to the challenge by competing with each other to establish bragging rights. Keeping track of everyone’s cool points became a large task in and of itself. To support the common notions of checking their work and paying attention while also providing outlets for boys’ natural physical energy, I implemented the following: if a student’s equation is incorrect, then he owes push-ups. Similarly, if his idea has already been submitted by another student and he does not notice, he owes push-ups. Impossible to foresee was the black market of push-ups created by some students who would do extra push-ups without having to, thereby building up a surplus to settle future debts and offering them with interest to classmates to settle their tabs. Along with these developments were conversations in class about what a tab is and what interest means. The Cool Date Day activity features low accessibility and high enrichment. It also develops new ways of thinking for the boys, with many of them saying they still do the activity over school breaks or now see patterns in places they never did before.